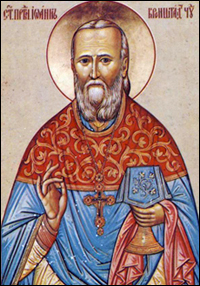 St. John of Kronstadt: Firmly purpose in your soul to hate every sin of thought, word, and deed, and when you are tempted to sin . . .
You don’t need a Kindle device to read the Kindle version of this book, which is available a very reduced cost. Try Amazon’s FREE Kindle Cloud Reader app for your computer, phone, or tablet. This entry was posted in Sayings from Saints, Elders, and Fathers, St. John of Kronstadt and tagged Compassion, Hatred, Love of Sin, Old Testament Events, Overcoming Sin/Passions, Prayer, Self Love, Sin, Temptation, The Fall on June 16, 2014 by .